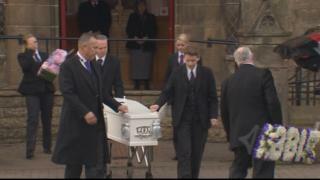 The funeral has taken place of Abbie Mclaren, the school pupil killed when she was stuck by a car in Motherwell. The private service for the 12-year-old took place in the town's Crosshill Church in Windmillhill Street. Abbie was injured on Tuesday 12 February after getting off a bus near her home. She died later at the Queen Elizabeth University Hospital. Martin McGuire, 38, has appeared at Hamilton Sheriff Court on five driving charges connected to the incident.